Despite the “wrong type of weather”. 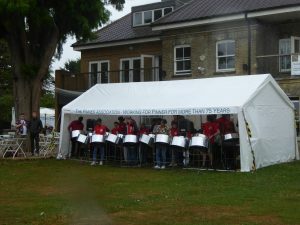 Those that ventured forth into Pinner Memorial Park were treated to some wonderful music by the Whitmore School Steel Band. The talented players bought a ray of sunshine to the park, and we were royally entertained. 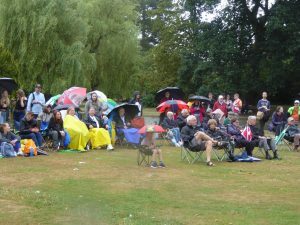 Thank you to the resilient audience for coming and sitting in the rain. Hopefully the weather will be better for Fats Rollini Jazz & Blues Band next week.